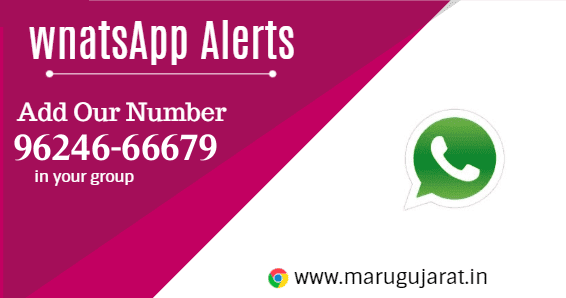 Whatsapp Alerts - :: MaruGujarat :: Official Site :: Gujarat's No. 1 Educational Website :: Maru gujarat :: મારું ગુજરાત , Gujarat Jobs, Maru gujarat, Marugujarat, GPSC,UPSC,TET,TAT,BANK EXAMS,STUDY MATERIALS,DOWNLOADS,ONLINE TEST,TIPS,PLANNER,ALL RESULT AT ONE PLACE,GUJARAT PUBLIC SERVICE COMMISSION (GPSC),UNION PUBLIC COMMISSION (UPSC), PANCHAYAT JUNIOR CLERK, GUJARAT UNIVERSITY,MAGAZINES,NEWS,GUJARAT STUDENTS, ROJGAAR SAMACHAR, AND THE BEST SITE FOR PREPARATIONS OF ALL OTHER COMPETITIVE EXAMS.  Please do not add this number in any group where "only admin can send messages". Please also do not add us as Admin in any group.  If the group is full please send "Join Group" on our WhatsApp Number 96246-66679 or Try again later.  In MG groups You cannot send any message in the group, Only Admin can.  If you would like to join a group where you can discuss exam related topics and share your media files, you can join our telegram group t.me/marugujaratgroup where there are more than 14000 Group members.  Please don't send any message to admin because no one will answer your queries there.  Please save our number with "MaruGujarat" on your mobile. Please Note: This is 3rd party App service so we do not have control over it. If they block our number please revisit this page to know the latest information about this service.